a year of wonders thanks to mr. zuckerberg, or should i say Big Z? 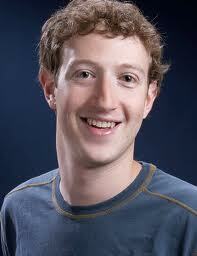 i am grateful to facebook and to mark zuckerberg, its founder, because i believe facebook changed my life. last year i made a resolution to meet every one of my then 325 facebook friends. facebook was created in 2004 by mark zuckerberg, who originally called it thefacebook and was limited to harvard students. later, mark dropped "the" and allowed college and high school students to join. in 2006, ordinary folks like me could open an account. and i did! over the course of the four years between uploading a profile picture and making a resolution to meet my friends, i have reconnected with friends i went to college and high school with, friends i have done business with, friends who are parents of friends of my two sons, friends who are friends i see every day, friends i have met only once or twice, and even friends i have never met but only connected with on facebook itself. i’m addicted to facebook scrabble but avoid mafia wars, farmville and other games i think of as time suckers. in keeping track of my progress last year, i listed the facebook friends i met with by number. joe kral, facebook friend #250 held a dog party for me. i'm not sure mark zuckerberg intended to have dogs as facebook users. i have quite a few dogs and one cat (nipper castino, facebook friend #95) but i guess the point is that ANYBODY and ANYTHING can have a facebook account! i’m grateful to mr. zuckerberg, to facebook, and to the facebook friends who have supported me in this project. just being willing to see me is a gift. . . .
i never would have imagined i would go to mumbai--and yet, here i am with facebook friend #244 anto prashanth in front of the shrine to the God of cab drivers. Anto is my facebook friend because he worked at an outsourcing company i worked with. we had only communicated via email and facebook. but i am continuing the project, focusing most on people who are like me–facebook friends who are anxious. i have panic attacks and sometimes spend weeks holed up in my house as if it were a bunker under siege. that’s sometimes called agoraphobia. some of my facebook friends have panic disorder, fibromyalgia, agoraphobia, addiction issues, and post traumatic stress disorder. facebook allows them to interact with friends and family but sometimes it becomes something that substitutes for real interaction. . . . i think that might have been my problem. facebook has strange, amorphous, ever changing rules on privacy, appearance, and use. recently, my account was shut down because–according to facebook–i was making too many friendship requests to people i don’t know. i found that odd because i haven’t been making friendship requests at all. i was given a seven day "hold" on making any new friendship requests to people i didn't know. but i wasn't making any friendship requests! however, when someone's putting you in the corner they generally are not going to listen to your protests. yesterday, i met facebook friend #303 and the mystery of why facebook thought i was making friendship requests to people i don’t know was solved. kenny sommer is a musician, poet, writer, agent and renaissance man. he toured with some bands in the nineties but is now sticking close to home, living with his parents in highland park. when i met him for lunch on this leap day, he had just watched a history channel documentary on quantum mechanics, another of his many interests. he has a few thousand facebook friends but is considering leaving facebook in order to simplify his life. and then it hit me: in order to be supportive of my project, kenny had been sending me “suggestions” of friends. i didn’t know that suggestions meant that if i clicked on, say, roger ebert the movie critic’s picture, i wasn’t actually confirming a friendship request (we HAD once met at a party and maybe roger remembered me)–oh, no, i was actually asking roger to be my friend based on kenny’s suggestion. and roger–and apparently others too–were responding that they had no idea who the hell i am. uh, oh, i guess i had been making friendship requests to people i don’t really know. . .
it was a delightful afternoon with kenny and as he toddled off to his next adventure, i considered whether i would call mr. zuckerberg. . . .
leap day is always full of miracles. in this particular town, all the furniture suddenly grew tenfold. by tomorrow morning, this chair will be a normal size. 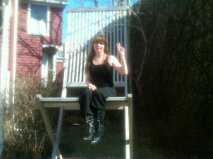 am i wrong or does this chair make my hips look smaller? This entry was posted on Thursday, March 1st, 2012 at 9:22 am	and tagged with dogs with facebook accounts, f2fb, facebook, friendship, leap day, mark zuckerberg, mumbai, seven day suspension of facebook account and posted in Uncategorized. You can follow any responses to this entry through the RSS 2.0 feed. I think you have a need to explore the world and facebook gives you that vehice. Good luck and keep on keeping on. i love the mighty chair. lol. it definitely made me feel like a little kid! I just found your blog, and was wondering. How do you get in touch with an agoraphobia support group? I have gotten to the point that I cannot leave my house without a lot of freaking out and much mental coaxing. Maybe reading your blog and talking to other people like me could help me get out more. I think what you are doing is amazing. I believe that we all want to feel connected to one another in this world and know that there is something binding us all together in this human family….. Kudos to you for doing such an inspiring thing! You bring inspiration,courage, grace and hope to so many. Without socia media and blogs, the extent of not only your struggles but your triumphs. I am grateful to live in an age when we can “friend” those around the world, share stories & , maybe, use this as a path to more peace & understanding. Thank you, ArLynn, for being part of this way of sharing with the world. Your voice speaks clearly and concisely with a note of shyness in your articulation which makes your posts that much more captivating to read with the non-capitalization and (what I presume) to be less emphasis on yourself so much as the experiences that unfold around you. I am inspired by your courage which is bravery despite fears, and whatever we want to label it as, I believe in your abilities to surmount past your obstacles to reach the goals you have set before you. 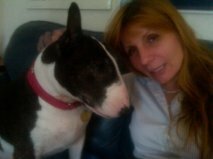 An absolutely amazing blog to read, and incredible story of the journey we must take to find ourselves at the end of it. Thank you for sharing. I’m warmed by your kindness to yourself, and to reach out to others.